If you do a lot of cooking, you have recipes that call for chicken stock. 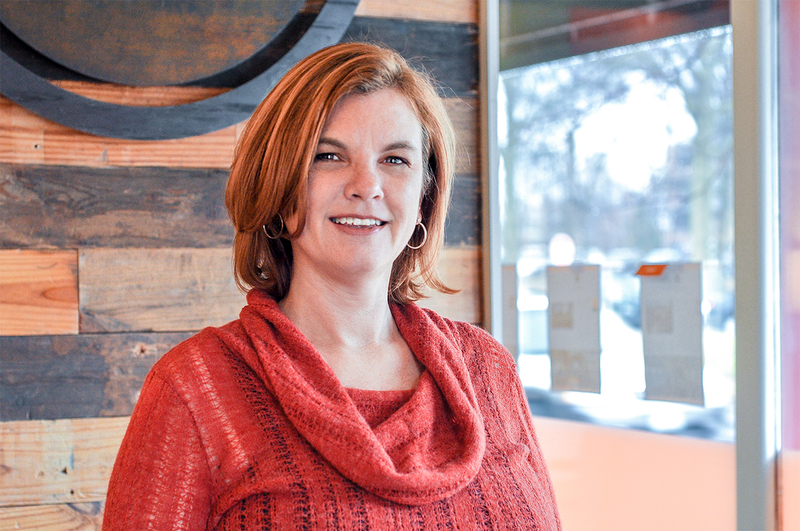 As most cooks know, taking a basic recipe and making substitutions is half the fun of cooking. When I learned how to make homemade vegetable stock, I started using it in all of my recipes that called for chicken stock. I’m a big fan of avoiding artificial ingredients whenever possible. Making my own pantry items to be used in other dishes is one of my favorite things to do. Making your own stock is not only easy and healthy, but will save you money too. Everything you need is stuff that would have ended up in your trash can. 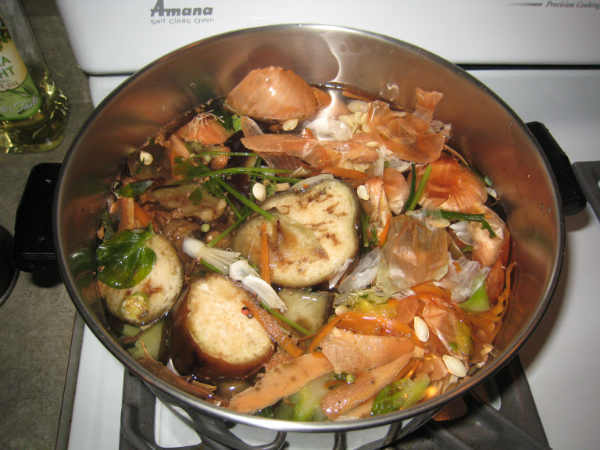 The first step in making vegetable stock is to start saving scraps of vegetables. 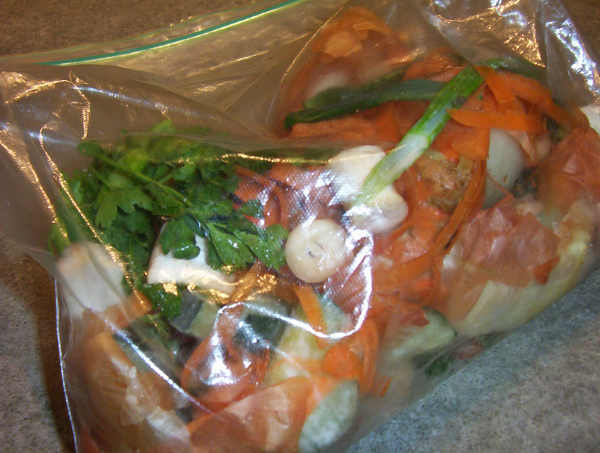 Using a large zip lock freezer bag that you keep in the freezer, add all of the trimmings and peels from your vegetables instead of throwing them into the trash. Just make sure you clean your vegetables before you start peeling…just imagine trying to clean carrot peels! Don’t be afraid to toss in any vegetable that doesn’t have a really strong flavor or would discolor the stock. I would avoid green pepper and beets for these reasons. Use what you like…I’ve included squash, eggplant and brussels sprouts in my stocks before. I also toss in all of those vegetables that would otherwise end up in the trash in the few days. I highly recommend going heavy on onion. It gives your stock a nice onion soup color and deep flavor. 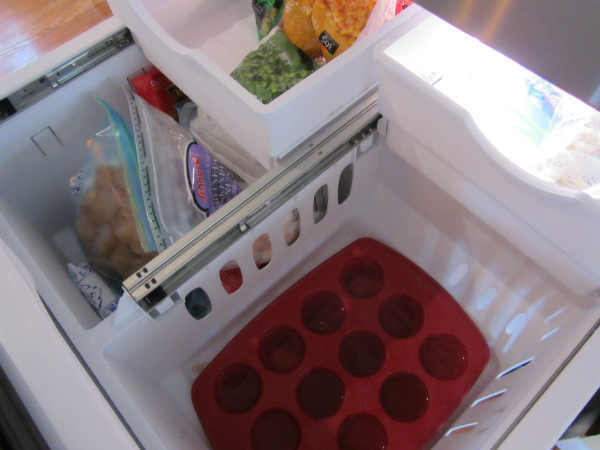 When the freezer bag is full, dump the contents into a large stock pot and fill it up with water. Add some seasonings. 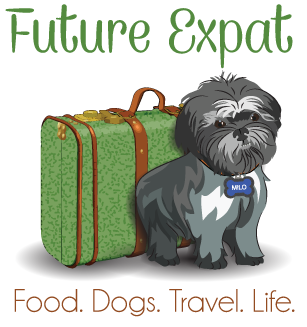 I usually add a tablespoon of whole peppercorns and a couple of bay leaves. I don’t normally add salt since it will get added later in the final recipes and it’s always easy to add more later. If you have favorite herbs, feel free to add them to the pot too. Or don’t. The vegetables really offer enough flavor. Bring the stock to a boil and then turn it down to a simmer. Let everything simmer for a couple of hours. I’ve never done this in a crock pot, but I’m sure you could do this in the slow cooker on LOW for 6-8 hours. When everything is soft and the water is the color of onion soup, put a strainer in a large bowl or another large pot. Pour the stock through the strainer and discard all of the vegetables. The next step is to freeze the stock so it will last for months. You’ll want to freeze the stock in small portions so you can pull out just what you need. 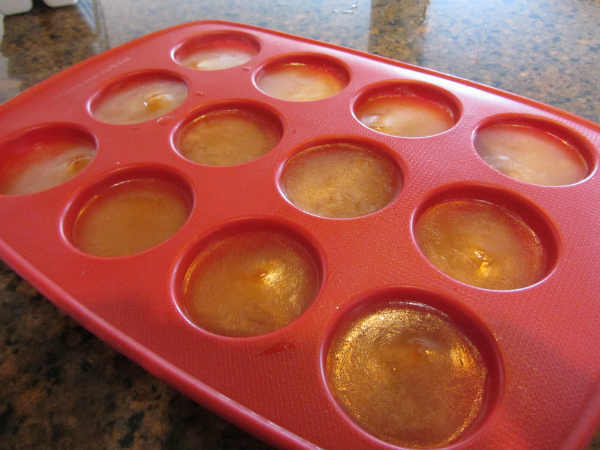 I’ve found that muffin tins give you about a 1/2 cup portion and ice cube trays make roughly 1/4 cup cubes. I bought a silicon muffin tin since it is really easy to pop out the frozen stock. My red muffin tin has a metal rack that it sits on for support in the oven, but my current freezer doesn’t have a compartment big enough to hold it on the rack. So, I put the muffin tin in the bottom of the freezer before filling it and then use a measuring cup to fill the tins…or just carefully pour the stock directly from a large bowl. After freezing overnight, the stock is ready for storing. 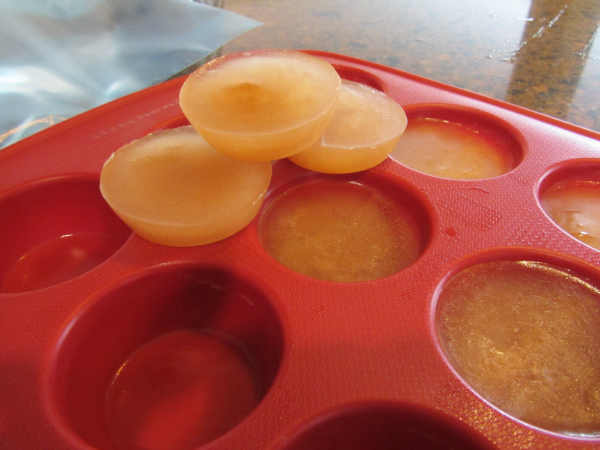 Since I only have space for one muffin tin in my freezer, I also freeze some of the stock into ice cube trays. Toss everything into a new freezer bag (the old one goes back in the freezer to start saving scraps for the next batch). The next time you are cooking soup or risotto, just pull out your best guess at how much you will need, then heat it in a small pot or in the microwave until melted. 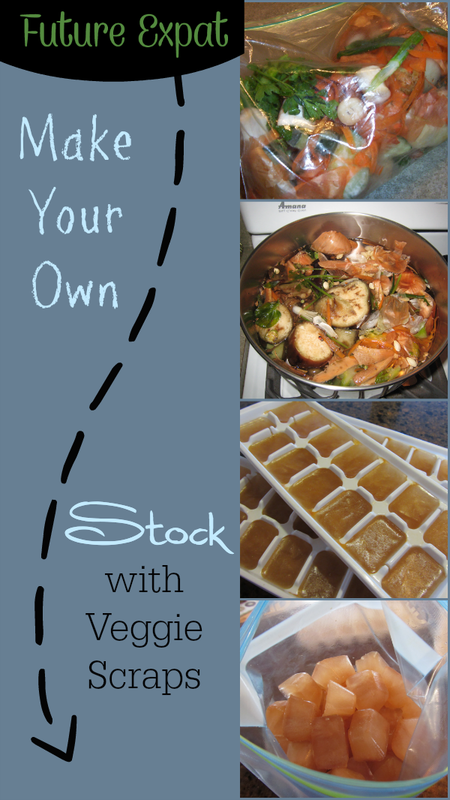 Now that I have a freezer full of stock, I could use some new recipes to use it up. What dishes do you make that use chicken or vegetable stock? This is really brilliant! We throw away onion peels and carrot peels all the time, but this is a much better use! I sooooo love this idea, I save the broth from meats I cook in the crock pot, and store it in a bowl which takes up lots of room. 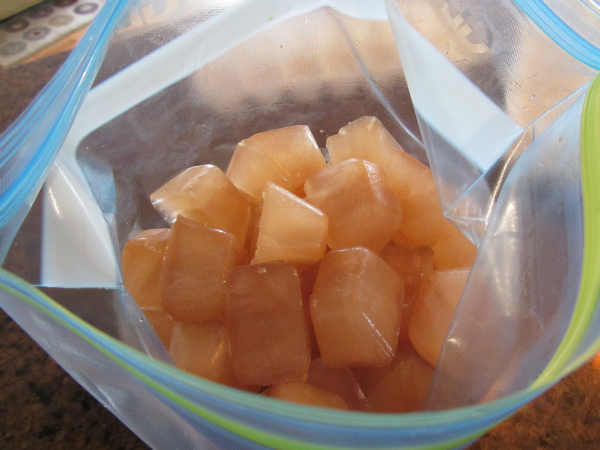 Using the ice cube trays and storing them in the bag is an excellent idea. Now I’m torn, save veggies scraps for stock or compost, hmmm maybe divide them up, pinning on my healthy eating board. Hi there, I did EXACTLY as you did in your directions, but my stock came out very bitter- like to the point where I had to dump it out, I gagged on the bitterness of it! I don’t understand how this happened? Maybe I had too many onion peels and carrots ends and not enough actual “meat” of the veggies? I’m so sorry that happened. I’ve made stock a bunch of time and never had it come out bitter. But to be honest, I’ve never tasted it right when it was finished. I just freeze it and then use it in recipes, but my recipes always tasted fine. Maybe it was the proportion of veggies you had in the stock. Or maybe it needs time to mellow after it is finished. My dad wasn’t a cook (and mom wasn’t either :), Thank goodness for Grandma and all she taught me) but he was an excellent soup maker. He always saved the peelings, etc. like this and would make a big pot of stock as a base for his soups. 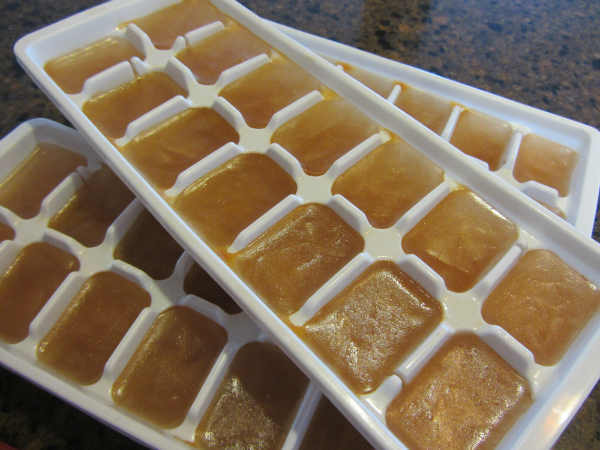 He never froze the stock in ice trays, etc. though, as he would just use it all in that pot of soup, but I lie the idea of using the muffin cups. I don’t make enough beef or chicken to make stock, but the person who gave me this recipe said you can have a bag for chicken skin/scraps and beef fat/trimmings. When those bags get full, use 1/2 beef or chicken and 1/2 veggies, and make your own meat stock too.